On marathon day, I awoke at 5:20 AM, jumped out of bed, and ran out the door to do a quick run. I ran for about 100 yards through the eerie darkness, about half a block and back to my house for the breakfast that would be my last significant carb-loading meal before the race. Breakfast consisted of raw sunflower seeds mixed with kimchi, dried cherries, and a bagel drizzled with flaxseed oil. This is what I normally eat for breakfast, though the fruit often varies. Sometimes I eat kiwis or mangoes instead of cherries. The day of a marathon and for days before I always stick to what my body is familiar with, to avoid any problems. Downtown Yonkers is just a few miles away so it was a quick ride to the start line. With the race set to start at 8 AM, I wanted to make sure I was there by 7:30. It was in the mid 60s, much warmer than last year. I did a few short warm up runs along the Hudson river(and 2 push-ups), and went back to the start line by 7:50 and drank the last of the juice I had with me. There were nearly 1,000 runners there, most of whom were doing the half-marathon; only about 167 were there for the full marathon, including me. After a delay, the race started a little after 8:05. It was a frenzied start like always, and I passed many runners and many runners passed me as we ran through northward through downtown Yonkers. Many people like last year were amazed by the joggling, and I was accused, like last year, of being a “show-off”. The route along Warburton avenue overlooks the Hudson river and often provides spectacular views, but unfortunately my stomach was giving me problems. It was mostly this vague stomach pain that tended to get worse whenever I would run faster. I started out slow, but was slowly picking up the pace. As we ran north, the route not only becomes hillier but also more suburban. After drinking some Gatorade at around mile 5, my stomach felt even worse. I did my best to ignore it, and was running even faster. I was just a little nauseous, but at the next aid station I grabbed some water and I felt much better. The hills were brutal. They felt even more brutal than last time because I refused to let them slow me down. The race starts at a little above sea level and involves over 1,000 feet total elevation climb. The big hill in Hastings(a small town just north of Yonkers) is especially steep, so much so, while doing the second loop I swore I heard the hills laugh. Some runners just walk up all or part of the way of these hills. After mile 5, the crowd of runners had mostly thinned out. By the time I looped around to the start line area in downtown Yonkers at the 13 mile mark(50% done), I was feeling super and the space between runners was so big I felt like I was doing a training run. My stomach problem was mostly forgotten, and the crowd support was unbelievable. There were even some people shouting “go vegan!” or “that’s my man!”. Now on my second loop(this is a double loop course), I all of a sudden felt this rush of energy that allowed me to pass a bunch of runners. I’m not sure how fast I was going, since I wasn’t able to record this on my Runkeeper, but I was probably running somewhere in the 7 minute mile range on a gentle incline. As I approached the steep hills of Hastings yet again, I started slowing down. And so did some of the other runners. 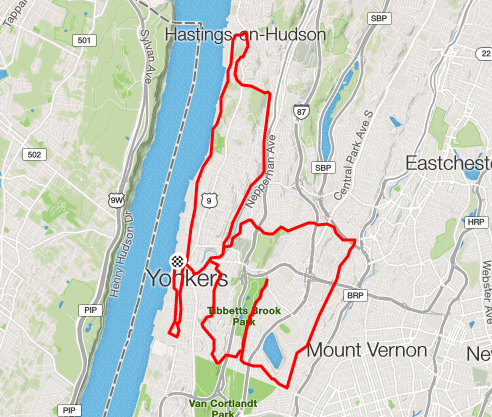 The hills seemingly went on forever while running south back to Yonkers and the temperature was well into the 70s. I felt like I had hit the wall by mile 18, though I would pick up the speed on the downhills. At mile 20, I realized I hadn’t dropped my balls even once, though I was expecting to before I reached the finish line. By mile 23 my legs felt so heavy that even small hills were becoming a challenge. I was sweating profusely on this unseasonably warm, sunny day. I grabbed my last Gatorade, and tried picking up my speed as I headed straight for the finish line along the Hudson. I think at this point the man in the tutu ran past me, complimenting me on my juggling. I complimented his style. 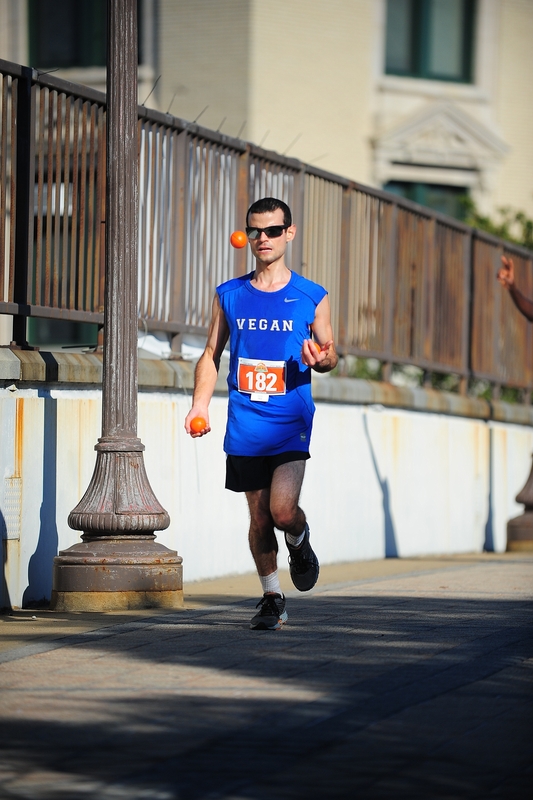 As I’m approaching the finish line along the Hudson river, there was some amazing crowd support, including from some fellow vegans. Since this was my second time running this, I was hoping for a PR. Last year I merely wanted to complete so I held back, but this year I often went all out. There was so much excitement as I crossed the finish line, I think even more than last year. It probably helps that I was significantly faster than last year. The results: I finished in 3:40, compared to 3:51 last year(the route was virtually identical to last year). This is a new PR for me. Out of the 167 finishers, I was 35. Of the 31 males in the 30 to 39 age group, I was 7th. But most shocking of all is that I didn’t drop the balls once. Sure I fumbled a few times, but I didn’t drop. This is my third marathon, and my first zero drops marathon. I wasn’t expecting this, not with all the brutal hills, pot-holes, other runners, and endless distractions. Not to mention the heat, exhaustion, and borderline delirium during the last few miles. I hope that while running this race I’ve inspired others to go vegan; that would make me happier than the new PR or the fact that this was a zero drops run. I’d rather drop 10 times and get 5 people interested in going vegan than drop zero times and have no one think of going vegan. 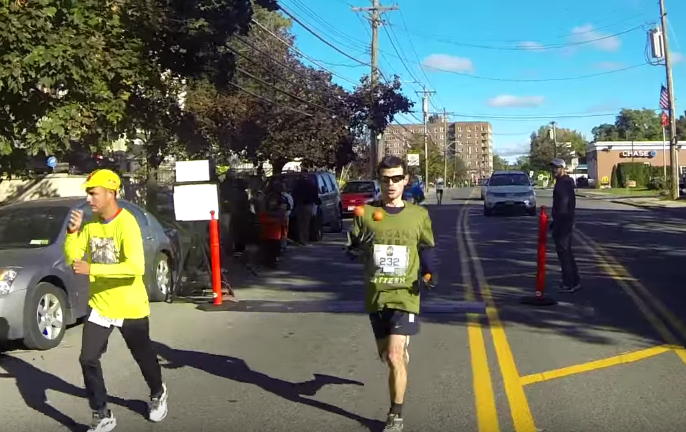 Congratulations to the amazing Oz Pearlman for winning the Yonkers Marathon(2:37) 2 years in a row! 1 day after winning the Hampton’s Marathon! Wow! Thanks to everyone for making this a wonderful race experience, especially the volunteers, and thanks to NYCRUNS for organizing this. All in all, a great race, and congratulations to everyone who finished the full and half marathon! Why did I experience so much stomach pain this time compared to last time? It could be due to my faster pace, but it may also be do to all the carb-loading I did in the days leading up to the marathon. I may have overdone it, I was eating tons of bread, pasta, and fruit, and sometimes I felt a little sick afterwards. I did have some probiotics like kimchi, but no kefir juice in the days before the race. I believe this helps, though sometimes probiotics can be unpredictable. It’s possible I drank too much juice before the race. According to some sources, fructose is more likely to cause stomach upset than other sugars. Not getting enough sleep sometimes plays a role in digestive upset, however, I believe I got more sleep this year compared to last year. I slept I think 7 1/2 hours versus 6 1/2 last year, and I was less nervous. Another difference from last year concerns the omega 3’s. Last year I was still taking vegan DHA/EPA supplements. I stopped doing this almost a year ago because I wasn’t sure if they were doing anything, and now I only take flaxseed oil for my omega 3’s. The ALA(alpha-linolenic acid) in flaxseed oil can convert to DHA(docosahexaenoic acid) and EPA(eicosapentaenoic acid) in many if not most people if they maintain the proper ratio of omega 3’s to other fats(the proper ratio is a controversial issue) and are healthy otherwise. Science has shown that the omega 3’s, DHA in particular, are important for optimal brain function, and also for cardiovascular health. Late last year I decided to stop taking the DHA/EPA supplement, just to see if I noticed any difference. I replaced it with flaxseed oil, which, as I explained before, contains a precursor essential fatty acid called ALA which can be converted to DHA and EPA. I figured that if I were to become deficient in DHA, or any other omega 3, my joggling performance, which requires a high level of neuromuscular functioning, would suffer. Since then, it seems my joggling performance has improved over last year. I didn’t drop once during several 20+ mile training runs(this didn’t happen last summer), and even the times I did drop, I dropped once or twice. Last year I could only go as far as 15 miles without dropping, while this year during training I went as far as 23 miles without dropping, and now this record was broken at the marathon and I can go 26.2 without dropping. All while not taking DHA/EPA supplements. This isn’t scientific, it’s not like I’ve had my blood tested, but I think it’s safe to say my DHA/EPA levels and omega 3’s in general are adequate. I think the ALA I get from flaxseed oil is converting to DHA/EPA in significant amounts. A lot more research needs to be done on these essential fatty acids, but I don’t think I need DHA/EPA supplementation anymore. To get adequate omega 3’s on a vegan diet, you simply need to eat flaxseeds or their oil, or chia seeds, or walnuts. It may not be wise to take DHA or EPA supplements, so consult a doctor or health professional if you think you can’t get enough from diet alone.